The problem preventing the upgrade appears to be the boot sequence in VirtualBox. It looks like the EFI implementation of VirtualBox does not honor the way macOS wants to select the startup disk/volume/startup script or in whatever way that is actually supposed to work. The result is that you can click through “Install macOS 10.13 Beta.app”, but after the restart the old system comes up as if nothing happened. Boot the VM normally in VirtualBox. Open “Install macOS 10.13 Beta.app”, click through until you get to “Restart”. As soon as the screen turns black, start to hammer the F12 key. Make sure your keyboard is grabbed by the VM. If you managed to hit F12 at the right time, the VirtualBox EFI should pop up. If the VM starts up normally, go back to step 2. Now use your arrow keys to select Boot Manager and hit Return, then launch the EFI Internal Shell from there. With the last command, the system should continue booting. After a short moment, the installer will turn up and begin to upgrade your system from macOS 10.12 Sierra to macOS 10.13 High Sierra. Now you will have to wait for the macOS Installer to finish, which may take a while. In case VirtualBox crashes with “Guru Meditation: VERR_IEM_INSTR_NOT_IMPLEMENTED” on the login screen when booting the new system, update to the latest VirtualBox test build, which implements the missing instruction. I had to hold fn-F8 to get into the boot manager. After I execute the commands listed above. Any idea on the fix? Same issue. Error loading kernel cache. Sorry that I did not come back to your questions. 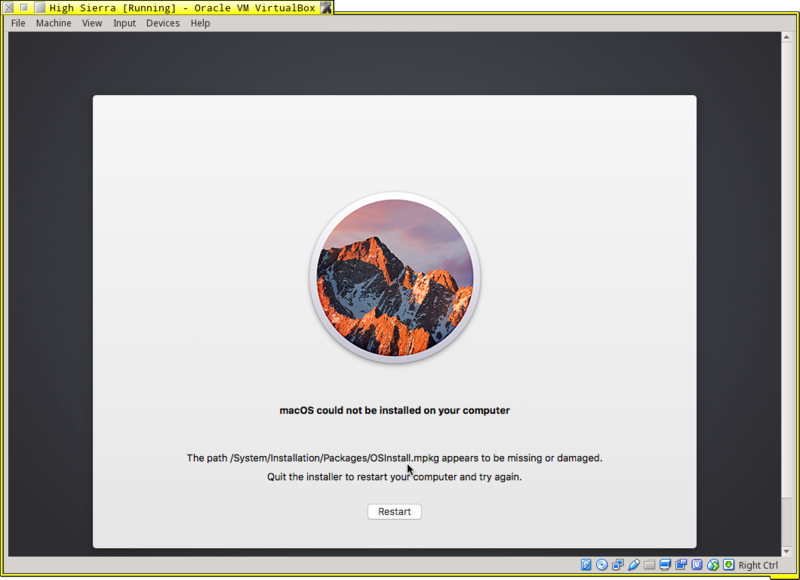 VirtualBox seems unable to boot the new macOS High Sierra Beta after migrating to APFS and there is no progress in getting that implemented. Therefore I decided to switch to VMWare Fusion instead, which I do not regret at all. I tried using latests Virtual Box (5.1.28) and current high sierra public release. Now, there is no Locked Files folder inside of macOS Install Data, so i am not able to to boot to the new installer. Any clues? Thanks for this blog entry. This was the smoking gun preventing me from upgrading my VirtualBox Sierra VM. This worked great for me and allowed to create a new High Sierra VM. I was not upgrading. I had to make sure SSD was not enabled in VirtualBox preferences otherwise High Sierra would automatically want to migrate to APFS. Great how-to, worked for me, but hitting F12 at the right time is very hard, so I made a snap-shot of the VM right before the reboot. That way you can avoid having to re-download the upgrade a couple of times. I still needed to ram the F12 as fast as I could to make the EFI shell option appear. I had a OS X 10.12 on VMWare and started to upgraded to 10.13. When I cam back I saw the blue screen (boot menu). And failed to use your instructions, since there is no fs1 reachable in the internal shell. fs0 and blk0 to blk3. And it seems they are empty! What can I do here? These instructions were written for VirtualBox and macOS 10.13 Developer Beta before APFS became mandatory. As far as I know, the VirtualBox EFI BIOS still does not support APFS. Personally I switched to VMWare Fusion due to this. One thing you could try in VIrtualBox is to remove the checkbox on “Solid-state drive” in the storage settings of the VM. Then the High Sierra installer should no longer try to upgrade the disk to APFS, but leave it as HFS. Following these steps, a message appears when run boot.efi –> “does prinf works? ?” and back to command line. after that I type reboot and nothing happens, I’m in the same version. I have the same problem as Pedro – “does printf works?? ?” and hangs…Any Idea what to do? -I manually downloaded the combo update package 10.13.3 from Apple and launched it in the VM. -The first part of update completed successfully, than it asked for restart. -I restarted, entered the VirtualBox EFI Shell and launched boot.efi manually from the indicated path. -I pressed Restart and the VM rebooted to High Sierra 10.13 (no update). I think we are close to target, but some details are still missing to complete the update successfully. Yes Yes Yes, thank, works perfectly. You can boot from instalation disk without shell, just open “boot from file” and find boot.efi on instalation disk. @Babak Vandad: Did you see any error codes in the output? If so, was one of them ID10T? can be solved by upgrading to the latest version of the Virtual box. Thanks! This worked for me on VirtualBox going from 10.12 to 10.13 not in the Beta. It works, even it’s not worked from the first attempt. Every time I tried the above I could not get it to work and I received the error – error loading kernel cache 0x9 VirtualBox. I did a bit of research and others were having the same issue, however, no one could get it to work. Ran the update, reboot the machine and F12’ed into the boot manager. I then tried the following. I tried @Ghost’s solution and I got the “does printf work?” message. Then, I restored form snapshot, booted into the old version, started the install again, On bootup I tried Pedro’s solution to boot from file and this time it worked! I struggled to update macOS but finally worked it out. You will find that any updates you apply will disappear after reboot as if they didn’t apply. You have to do the following as the update only completes after a reboot done in a certain way. 1) Download the update from the Apple website or apply from the App store. 2) When promoted to re-boot, press the F12 immediately after the restart, make sure the keyboard is captured in Virtualbox. 3) Press ESC key to stop the auto boot before the countdown finishes. You only have a few seconds to do this. 4) In the BOOT MANAGER option choose EFI Internal Shell. The system should then boot and continue the install and you are done. It is very important that you do all this on the first re-boot after applying the initial update as the update files are copied ready to complete the process. Miss the first boot and you will have to start again. worked exactly as you described it! thanks mate! 1. Boot the VM normally in VirtualBox. 2. Open “Install macOS 10.13 Beta.app”, click through until you get to “Restart”. 3. As soon as the screen turns black, start to hammer the window+r key. Make sure your keyboard is grabbed by the VM. 4. If you managed to hit window+r at the right time, the VirtualBox EFI should pop up. If the VM starts up normally, go back to step 2. 5. Now use your arrow keys to select Boot Manager and hit Return, then launch the EFI Internal Shell from there. @Ghost’s solution worked for me. Thanks! Thanks Rainer Müller. This worked for me just fine. I even was surprised didn’t get first “restart” .. system just restarted, I didn’t repeat from step (2) , I just restarted again and hit F12, followed procedure and in aout 90 minutes system rebooted to High Sierra … !! fantastic. Updating from High Sierra 10.x to the latest update through the store, it won’t boot anymore. tried F12 and the folder is not there, since it was a 2.6 Gb update. Anyway to get this update to work? Using VirtualBox 5.2.18. I had High Sierra 10.13.4 installed and working well, but 10.13.6 would not install from the App Store. I found this post when searching, and the steps listed worked first time. Thanks for the post! Windows+R does nothing either. I guess @kundan meant HOST+F12 so i tried that (restarting the machine upon restart). I have to press ESC right after that to enter the boot menu but after launching boot.efi i end up getting a kernel cache error. thank you @kundan this worked perfectly. F12 is the key that I used to get in. Has anyone got this working with Mojave? I tried to upgrade to Mojave from Sierra via the appstore and it crashed my partition. EFI manager did not recognize FS1 or FS2. This is not working in VirtualBox 5.2.18. Reboots endlessly. I was getting the Error!!! Load prelinked kernel with status 0x800000000000000e while trying to upgrade to Mojave MacOs on a VirtualBox virtual machine. Turns out I had the older USB 2 compatibility in the settings for VirtualBox. If you run into this issue turn off the VM, go into VirtualBox settings USB and select USB 3.0 controller. Restart the VM and issue should be solved. Has anybody been able to upgrade to Mojave yet ? This is great, you can also get to it from “Boot Maintenance” > “Boot From File” and navigating to the boot.ini visually if that’s easier. I finally managed to get beyond “Error loading kernel cache (0xe)”. The solution was to entirely delete the “macOS Install Data” Folder and simply restart the update in sierra. But this folder isn’t to delete easily. I tried it like described above. But just tried it again and second time it worked.